This application was sprayed on precast stand up panels in downtown Calgary. The R-value & vapour barrier were easily achieved by spraying 3 inches of polyurethane foam. The finish inside was drywall. The owners of this condo complex are very happy with the comfort level in winter & summer when cooling / air conditioning is operating. This application was sprayed on cinder block during construction. The finished wall was brick attached to the ties as shown on architectural details shown in other section of our website. The cost of heating / cooling this school was reduced by approx. 40% and the system was installed cheaper than full membrane and rigid fibreglas insulation. This is a precast structure where polyurethane foam spray was used as an insulation as well as vapor barrier forming a monolithic (seamless) blanket of insulation on the interior wall. The finish product was covered by ½ inch gypsum board to conform to local fire codes. Prior to application the frost build up was severe, but sprayfoam insulated and preformed very well eliminating all condensation and frost. 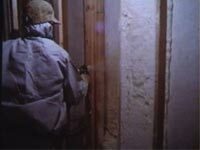 This house was sprayed with 3.5" polyurethane foam making the R-value (R=24) very good for a 2X4 wall. This system is CCMC. approved and custom homes are becoming a large part of the foam industry today. The cost is more than fibreglass insulation but the return on heating costs is made up very quickly. Vaulted ceilings are a prime candidate for spray foam insulation. 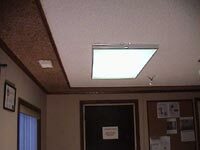 This product is designed for office or recreation areas where sound transfer and echo are to be reduced. The photo shows a typical office application, note the color (Tan/ White), transfer of sound is greatly reduced in this office when on the phone or intercom. Other applications include swimming pools for echo & parking garages for insulation. The building code requires a fire rating on structural steel floors / walls & roof assemblies. 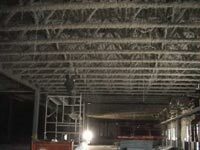 The photo shows a typical application of Hi-bar mineral fibre on steel joists and metal Q-decking. This project was a warehouse with offices above the sprayed area. This product is a low density expanding foam. The product has a R-Value of 3.7 per inch. The air sealing properties make it affordable and a big winner for new housing. This product is effective in preventing the growth of mould and mildew, since it forms a barrier on the interior of the walls. Click the photo to the left or here to see more photos from a demo video for Icynene application. 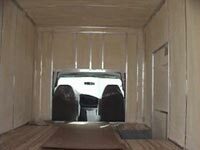 This cargo van was heated in winter and applicated with 2" polyurethane foam insulation. The same application can be done for refrigerated trailers making foam the perfect choice for the transportation industry. 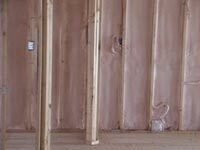 A plywood sheathing can be installed over the insulation attached to the metal stud framing members. We are pleased to announce there are several products on the market that have been approved by the federal government. This company offers all of the products and is authorized to apply all approved products. 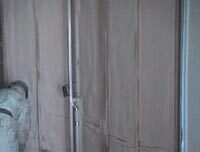 These products are tested air barriers and have been tested by the manufacturers for density, off gassing, R-value etc. A CCMC report is available from CUFCA at www.cufca.ca. An application standard and master specification is also available through CUFCA or this office at office@sheafoams.ca.